This has to have been our busiest month since we started all the work on the 1881-O. In mid-July we received images for 65 coins back from VSS and we added them to the web site, bringing our total inventory to 819 coins. A brief audit of our inventory proved that in all the activity over the past three years we could account for all the coins. This is a small miracle given all the activity. 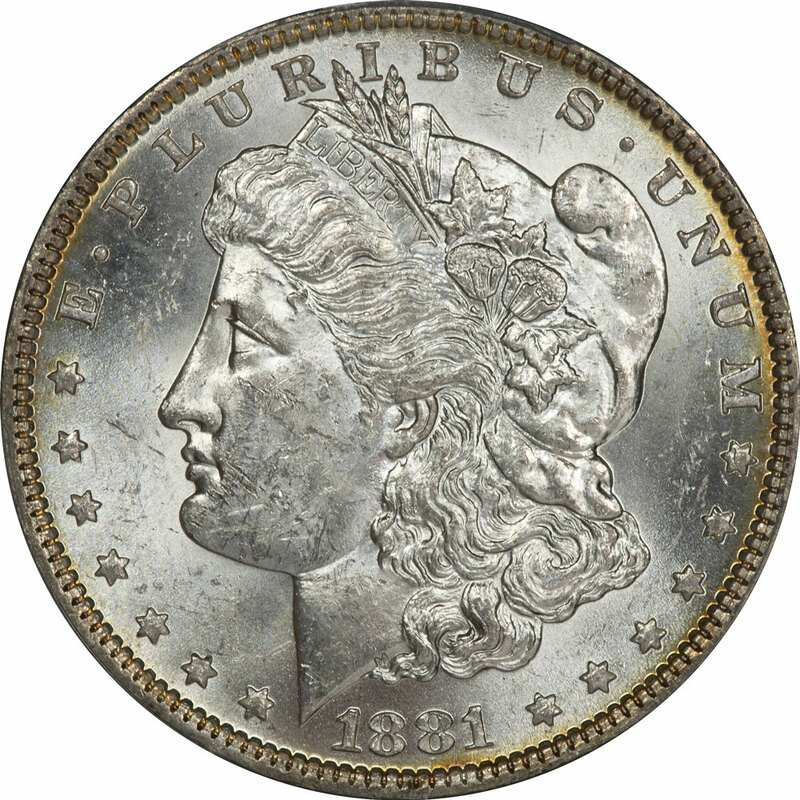 There were eight new toned coins in the group and those have also been added to the Toned Coins Section and there is an abbreviated view of those in the right hand column of this page. On July 31 we received the images for another submission of 31 coins. These will go up on the site in early August and bring our total inventory on the web site to 850. We are continuing to analyze die cracks and will post them here as well as the die pages. We have also added a page to view all the die cracks on all obverse dies so that when we finish there will be a single page for reference. That page can be referenced here and on the Studies link in the menu. This month we are analyzing as many obverse dies where two VAMs share the same designated die as possible. These require more analysis, so they may take a while. While waiting on the VSS images we did a little side trip through prices since we see a lot of griping about what has happened. That page is now in the STUDIES section of the web site as well as our conclusions. If you are a pure investor with only the highest grade coins, you feel awful. But if you are a pure collector you feel very differently as most grades from MS64 on down have done well. Working through this has helped us feel a little better because we buy at grades MS64 and below for all our studies. This will not hold for all series, but it is at least directionally correct. We got into a discussion on VAMworld about a feature at the neck on VAM 1D - Pummeled Eye. On investigation we believe this is an additional way to recognize the 1D all the way down to grade VF 35. So we went back and added photos to The Aging 1D page to show it at all our grades. So far this has been an excellent way to identify coins on Internet sales since many coins are photographed in a way that they appear to have the damaged eye socket. And then a miracle happened and we found a VAM1J - Overpolished Reverse. This was one of our few missing VAMs and closes a gap that has been difficult as we narrow down on a complete set of VAMs. The coin is an AU58, PCGS 84368570. Even though we only have one it does have enough die cracks to include some good information on that study. The only weakness in this example is that the slight wear flattened the lines in the right wing a bit and they are not visible in our photographs. If all of this were not enough, we also updated our VAM 5 - O/O Right, Doubled 1 study to add three new grades with illustrations. We now have 25 examples ranging from AU 50 up to MS65DMPL. There is a lot there to learn about how coins look at different grades. Fortunately for us we have clean examples in all grades and the secondary markers are not needed. But if we can find more in lower grades this will change. And last, we added a quick identification sequence for VAM 28 so that it is now easier to determine if you have a die 1, 2, or 3. Our die study has taken us into some uncharted territory, or at least uncharted for us. While we are focused on the obverse dies, the reverse dies have not fallen off the radar. 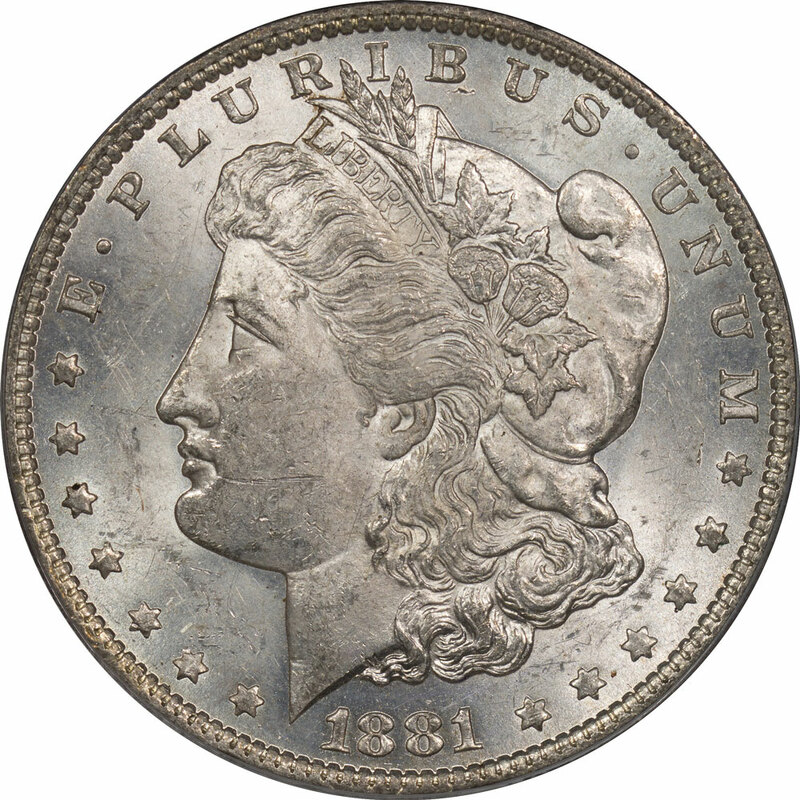 We thought we had located two features that we have never seen noted on the 1881-O series, the notched left star and the doubled W in the motto. Until July 18 we thought all 1881-O had both of these features. But then we located one without the doubled W, but still with the notched star. First, the star notch always appears on the same star in the exact same location and in the same proportion. Second, it appears on every working die which we assume places it back up the line at the master die stage where the star punch was added. 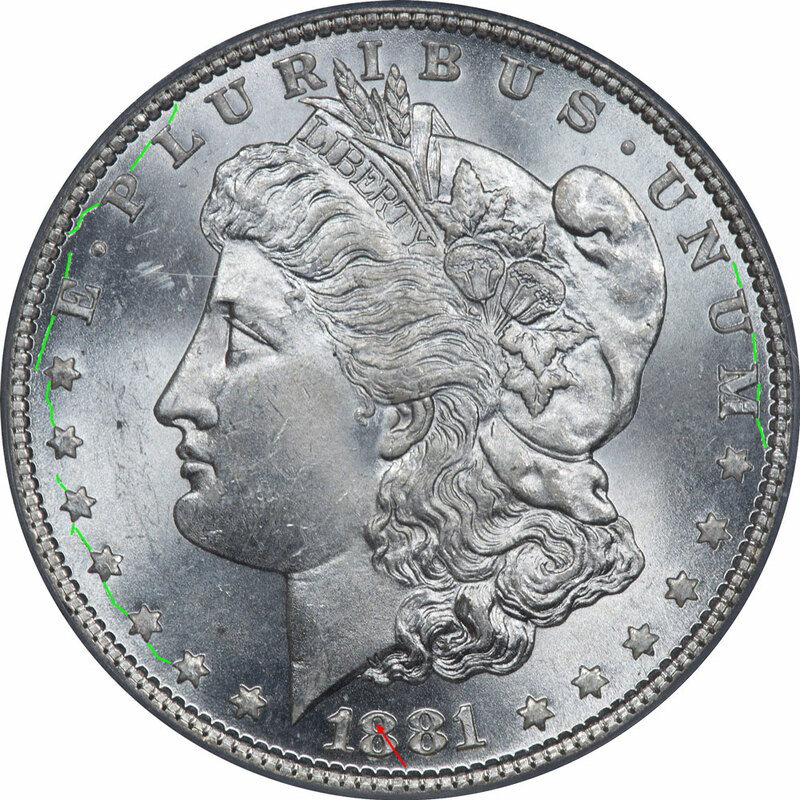 And last, it appears on coins of many grades within a single VAM so it must not have occurred on individual coins as a strike feature. If you find this feature on a coin and look at it under magnification you will see that it is a little more pronounced and recognizable than the picture below would indicate. This image is from coin 21911454, an MS62 VAM 40. The doubled W in the motto is also present on almost every coin and at every grade. It will appear different when the whole motto is doubled since it could appear tripled or more, but it is almost always there. The doubled W needs further investigation. The coin in question is at VSS and when it returns we will do more work to understand this feature. Someone started a new page on VAMworld for the "Bearded Eagle" varieties. 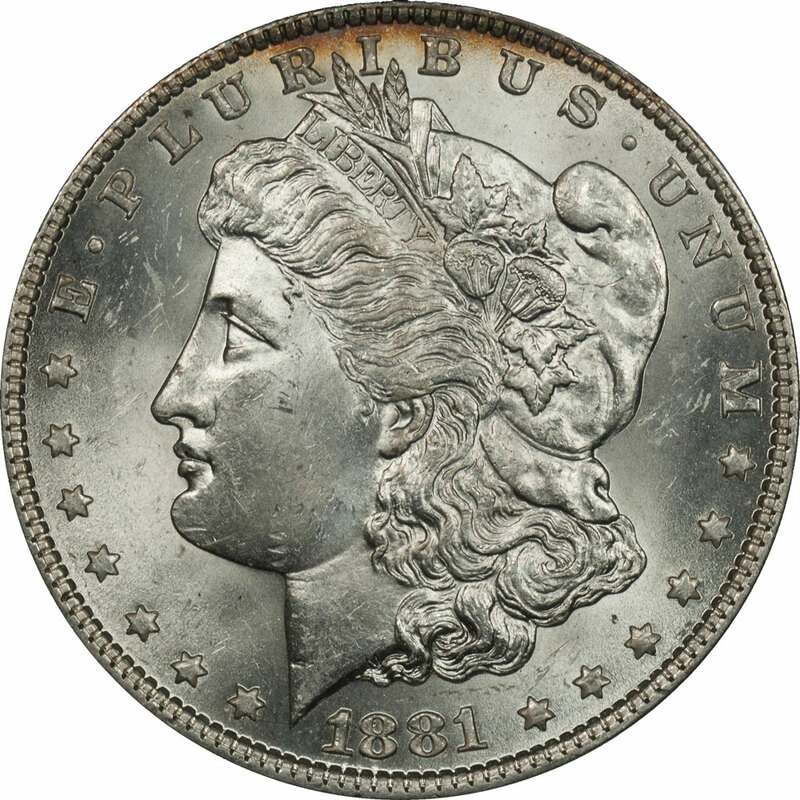 There are six of these in the 1881-O series and we think worth some study. The six VAMs are 1B2, 2A, 2B, 33B, 50A, and 55A. We have examples of all in our collection. If you have studied this feature then you know it is most visible on the 1B2, but varies by degree of visibility on each. There is a new link in the SIMILITUDES section of the web site. We needed a little something to read while looking for something more substantiative to ponder and happened into one of the best books we have read on mining during the 1849 gold rush. The Diary of a Forty-Niner is just one of those rare finds that is worth the time to read to understand the lives of those who went west seeking their fortune. The book was recently published in January of 2016 and is a mere 139 pages. But in it you get a first hand description of the life, relationships, living conditions, the economy, and many other issues through the eyes of a man who lived it every day. This one is worth a few hours to build your knowledge of the times. After finishing up The Diary of a Forty-Niner we decided to tackle this book and we are glad we did. This is probably one we should have worked our way through years ago, but for some reason we had postponed reading it. Anything that is in its seventh edition obviously has met with commercial success and this is a well known reference to everything coin collecting. The Coin Collector's Survival Manual can be a bit dry, but it is packed with information that is useful to all regardless of collecting experience. The first batch of coins from VSS has some great toned coins that cover a wide range of grades. Several of these are close to monster toned and of particular interest to us as we study the color. We posted a few of these to CoinTalk and received very favorable comments. In May 2017 we started an analysis of die cracks that we are likening to the uniqueness of fingerprints. We continue that analysis at this point with dies associated with only two VAMs. Obverse Die 7 appears with two VAMs, 15 and 41. Both VAMs are labeled as Doubled 1, but in both cases it is the last 1 and not the first. Both feature the Spike in 8. The variation in the two VAMs is the reverse where VAM 15 is paired with a Normal Die a and VAM 41 is paired with Die p. Reverse Die p has doubled and tripled features. Obverse Die 7 is one where we have a large number of examples. As of this writing we have sixteen examples with VAM 15 and seven examples with VAM 41. In no case do any of the coins exhibit any die cracks or breaks, so these are all early die state examples. But, we do believe the die was used on VAM 15 first and then later paired with Reverse Die p after re-polishing. This image is from coin 29887680, an MS 63, VAM 15 coin. It shows a small tip toward the end of the hair curls and a small hair remnant under the designer's initial. This example is from coin 03739502, an MS 63, VAM 41. In this example the hair tip is essentially gone, indicating some additional polishing. There isn't a lot of difference in the two, but enough to notice and make us think that VAM 15 came first. Obverse Die 10 appears on two VAMs, 1B2 and 18. These two VAMs are easily distinguished because VAM 1B2 is clashed and VAM 18 is not. We have a lot of examples of each VAM to work with for the analysis. There are ten VAM 1B2 coins and four VAM 18 coins. Characteristic of Die 10 is date doubling of the 18, which is present on both. But as a note, the Spike in the upper loop of the first 8 is just starting to develop with VAM 1B2 and can appear to be only an indication of a Spike all the way to a very small one. The above coin is 32819784, an MS 62 VAM 1B2. All of the die cracks exhibited on our examples are somewhat superficial and just starting to develop. 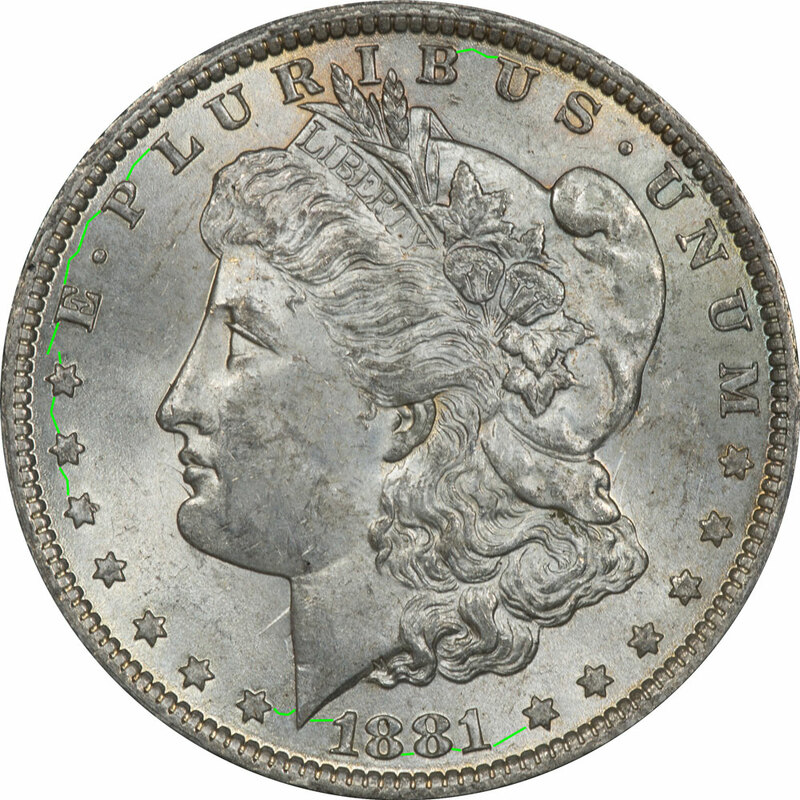 In our photographs there appear to be some minor cracks developing in the hair around the larger bear claw, but these are not visible under magnification of the actual coin. We could not find these cracks on others under a microscope. This coin is 21499159, an MS62 VAM 18. Unlike its counterpart the Spike in the first 8 is much stronger, but there are no signs of die cracks on any of our examples. But which VAM came first, and how do we know? We believe that VAM 18 came first and was then followed later by VAM 1B2. The above image is from our VAM 18 and shows that the hair terminates in a point almost as complete as a full set of curls. Also, the Spike in 8 feature is large but rounded. Then on VAM 1B2 the hair is truncated much shorter and the area immediately below the designer's initial has been cleaned out from polishing. The Spike in 8 has apparently been polished out, not completely but almost completely. But this does not prove the origin of the Spike in 8 because we don't yet have proof that VAM 18 is the earliest die state. Obverse Die 13 is paired with Reverse Die d to form VAM 22. 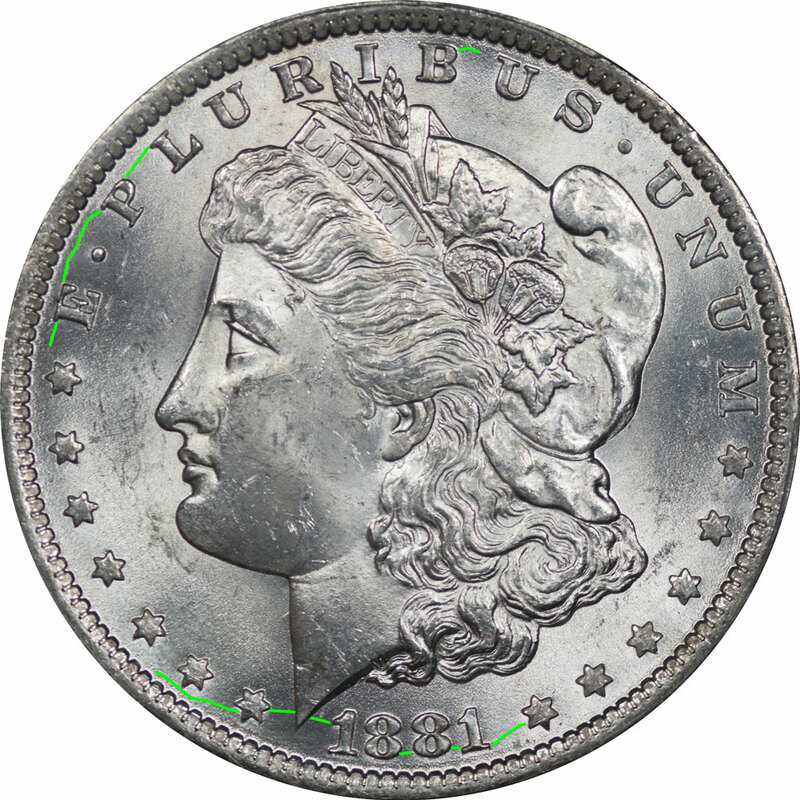 The reverse die has a mint mark that is centered and tilted left. When paired with Reverse Die a this forms VAM 49, but with the distinctive feature of a die gouge through the DOL in DOLLAR. The common characteristic of Obverse Die 13 is distinctive date doubling of the first and last 1 at the top of each numeral. We have twenty-three examples of VAM 22, but only three of VAM 49 which we would assume is the less common. None of the three examples of VAM 49 show any signs of die cracks or breaks, nor do the examples of VAM 22. Interestingly the die shows the same degree of polishing, so it was not removed from service to be re-basined between uses. Die 13 shows the familiar Spike in 8 with both VAMs. This is PCGS 25699416, an MS65PL coin. It is a VAM 22 and, like all our VAM 22 coins, shows no die cracks. This is PCGS 32125849, an MS62 coin. It is a VAM 49 and, like all our VAM 49 coins, shows no die cracks. Obverse Die 22 is paired with two VAMs, but in reality just one because the VAMs are 33 and 33B. VAM 33B is the extreme clashed version of VAM 33, and is a WOW classified VAM. Because these are merely clashed versions of the same die, by definition there can be no variance in the details of the die. But what about die cracks and breaks? With the VAM 33 we have seven examples as of this discussion. The span the range from no die cracks to some pretty nice ones. On these VAMs the major die cracks are on the reverse, but we found one coin with significant obverse die cracks. We have seven VAM 33 coins and the extent of die cracks is wide. This is the most extreme example we can find, and it is an MS63, PCGS 81802182. We only have one example of a VAM 33B, but it shows cracking that closely mirrors that of the VAM 33. However, we have only one example of a VAM 33B and as time goes on we should locate more for analysis. This coin, although dirty, is an MS 62, PCGS 33582020. With just this one example it appears that VAM 33B may have come first, but that is a superficial analysis. Obverse Die 17 is very interesting because it has a primary characteristic of a doubled profile. As currently defined, when paired with Reverse Die l, it produces VAM 23. 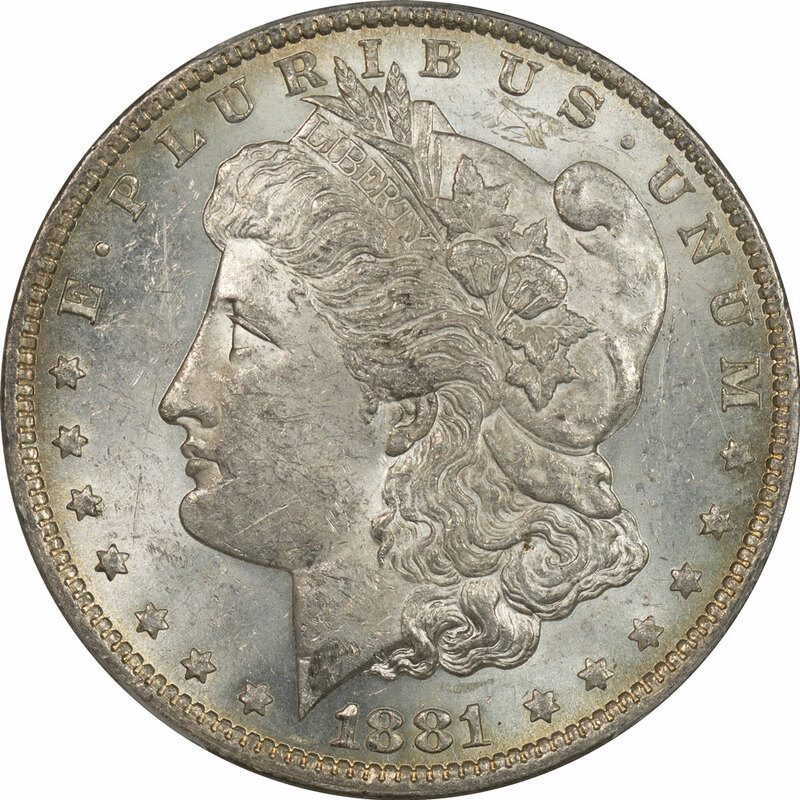 When paired with Obverse Die a, it produces VAM 28, one of the most common VAMs and one that almost always appears in either PL or DMPL state. But the die cracks and other characteristics may make this pairing almost impossible, so further analysis will be needed. As of this date we have six examples of VAM 23 and they are all Mint State 63 or lower. Because they are below PL and DMPL states there is a greater chance of finding die crack examples. These images are from coin 10003913, an MS 63 example. 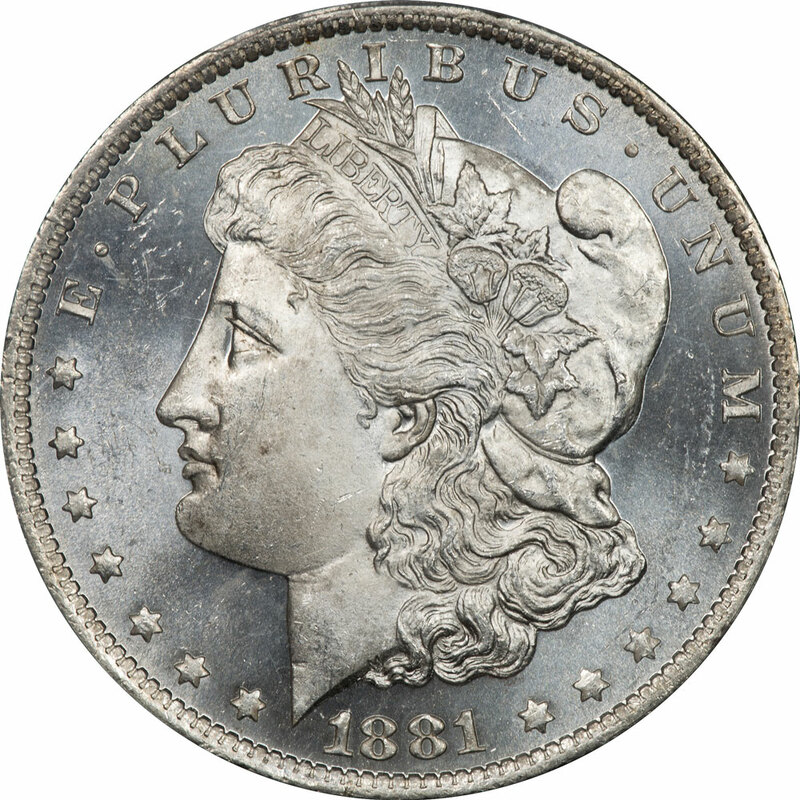 At this stage the die exhibits several perimeter cracks both in front and behind the Liberty bust. The coin also has the familiar Spike in 8. 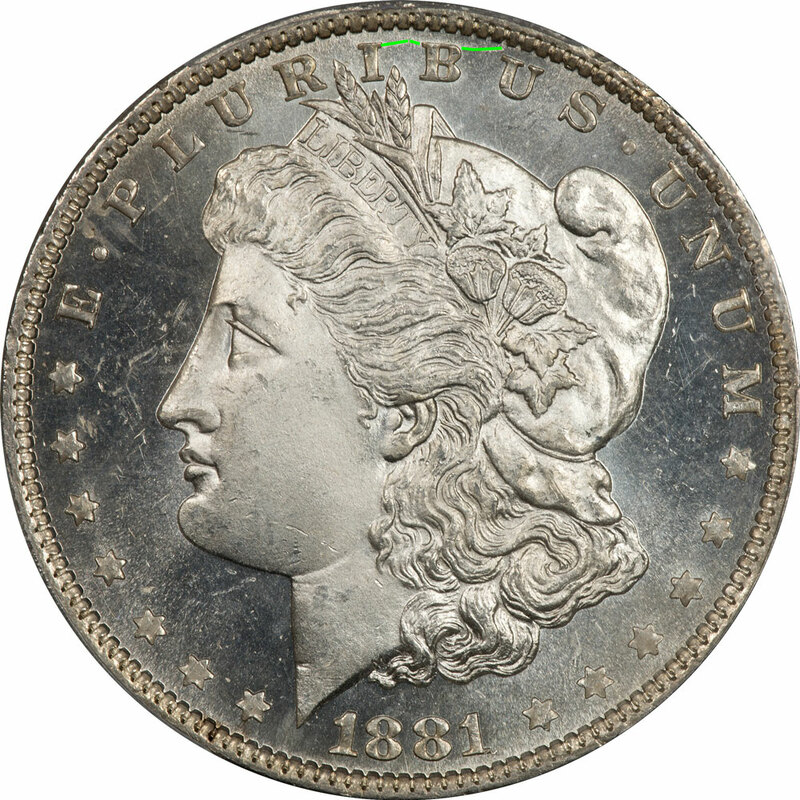 The hair curls would indicate that this die has been polished very little and there is little deterioration in the detail. VAM 28 is very different and we have very few examples below PL and DMPL for Die 3, the most common die; but we do have multiple examples for Dies 1 and 2. This is an MS61, VAM 28, Die 1, PCGS 29923226. It shows no die cracks on any example in our collection. Die 1 is identifiable by the spikes in the upper loop of both 8s. This is a VAM 28, Die 2. 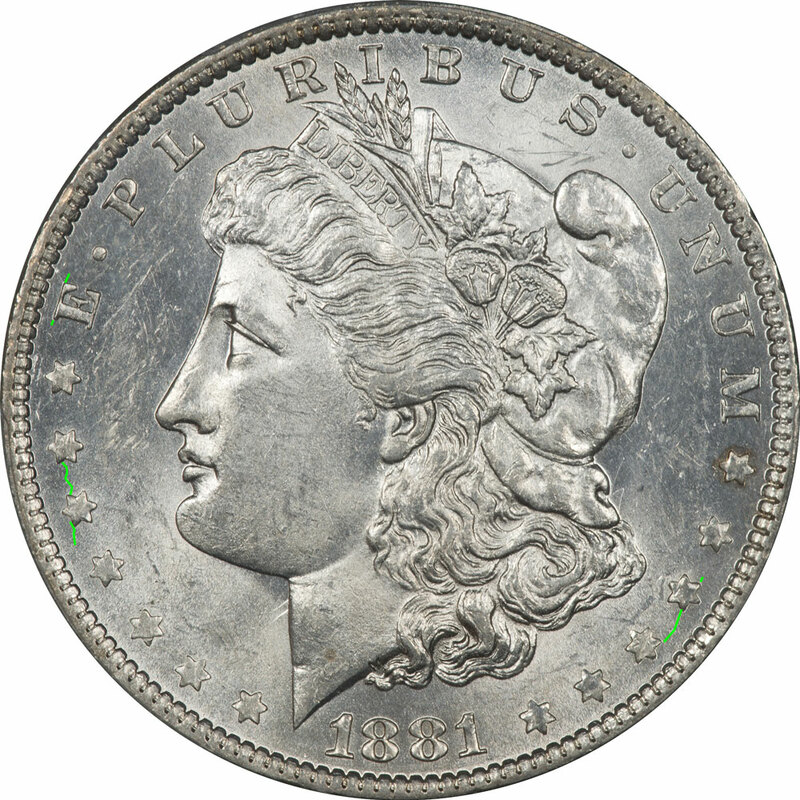 It is an MS 61, PCGS 19005644. It shows no die cracks on any of the examples in our collection. Die 2 is easily identified by the small die gouge on the second bottom feather in the eagle's left wing. This is coin 25689508, an MS65DMPL, VAM 28, Die 3. This die does exhibit a small crack on most examples. However this crack is totally different than on VAM 23. This die is readily identifiable by the diagonal die gouge in the R of LIBERTY. A significant amount of research is needed to determine if Obverse Die 17 is in fact used for both VAM 23 and VAM 28.